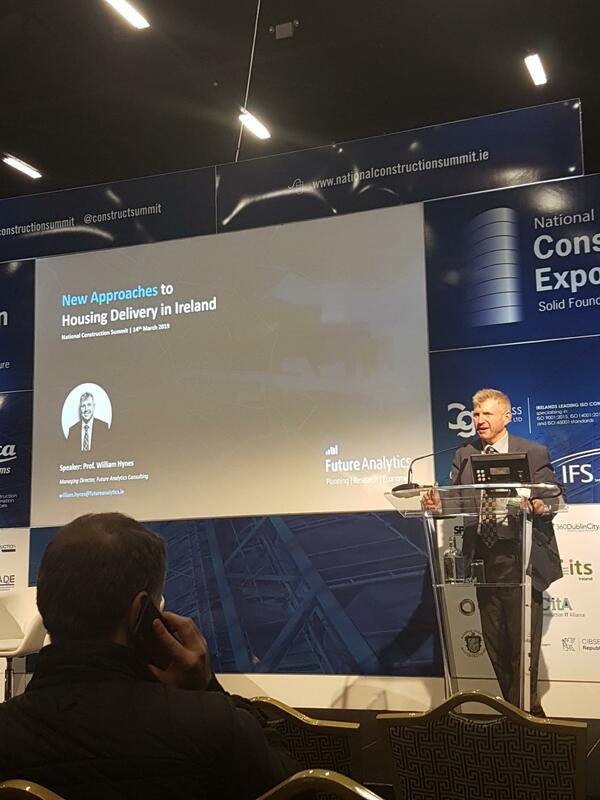 Future Analytics Consulting’s Managing Director, Professor William Hynes, was one of the guest speakers at the 5th National Construction Summit, held on the 14th March in the Citywest Hotel, Dublin. The Summit brought together over 2,000 representatives from the construction sector in order to stimulate debate, connect and share their expertise. As such, Professor Hynes was delighted to have an opportunity to present on the ‘’New Approaches to Housing Delivery in Ireland’’. The delivery of housing in Ireland is a fraught topic of discussion in contemporary discourse, with a complex series of challenges creating the current situation being experienced. In this respect, it is imperative that we, as a society, take new and innovative approaches to the delivery of housing. FAC’s expertise in data analytics and detailed knowledge of Ireland’s demographic composition, coupled with our extensive experience in the planning and development sectors mean we are ideally placed to offer insights into the future approaches to housing delivery. William’s presentation focussed on some of the many layers that exist around this topic, such as: Ireland’s current population dynamics; the existing and future situation of the housing market; the regulatory framework that dictates the trajectory of development; and, the key considerations required to determine models of delivery. He also highlighted BIMCert (https://energybimcert.eu/), a H2020 project that FAC are involved in, which aims to provide a curriculum in BIM, promote energy-efficient construction, and encourage a greener built environment particularly within the housing sector, across the supply chain.